Today is the next instalment in my healthy eating series and we are going to look at yummy breakfast options from Lizi's. Lizi's is a company created by Dr Mick Shaw and his wife Lizi, both of whom are true foodies and have a background in both organic farming and science. The company was set up in 2003 with an aim to promote well being induced by good food without creating the artificial blood sugar fluctuations often produced by convenience foods. Sounds good to me! I was lucky enough to have the chance to try some of their range out and I'm going to be sharing my thoughts below so keep reading to find out! First let's talk about the popular Lizi's low sugar granola*. What is sold today is a modified recipe of the original toasted muesli mix created by Lizi and loved by guests in their B&B cottage in Oxfordshire. It is high in fibre which will keep you fuller for longer and made from oats, nuts and seeds backed with the minimum amount of added sugar. In total the sugar content (natural and added) is less than 4% so perfect for anyone looking for a low sugar alternative to regular cereals. The granola is suitable for vegetarians and vegans as it doesn't contain dairy and goes just as great with milk alternatives such as almond milk and soya milk. My thoughts on this product are that firstly, it's not overly sweet, which I like. The taste is a lot more subtle and natural with the added nuttiness from the cashew, almond, hazelnut and walnut pieces. I had this with the milk from my previous review post and it was yummy, but I have also paired it up with natural fat free yogurt and added in some fruit which I think has to be the absolute winning combo for me. Pricewise you are looking at £3.75 for a 500g bag which is pretty good in my opinion and the resealable bag is great to have on my desk at work to grab in the morning. Next let's talk about the On The Go products, these are absolute genius. You don't need milk or a bowl and the little packs come with a spoon so really are perfect when you are literally on the go. The packet turns into a cup and as you can see from the picture the spoon is hidden in the base, all you do is add water and mix it up and it's all lovely and creamy. I can imagine having these on a long train journey and plan to take a couple on my trip to Liverpool in a few weeks time. The flavours I tried were the treacle & pecan*, bursting with yummy seeds and nuts and the belgian chocolate* which was my favourite of the two because I loved the mix of tastes and textures. They also do original in the On The Go format for reference and the packs are sold in batches of 10 for £10 so £1 per pack which is great value. 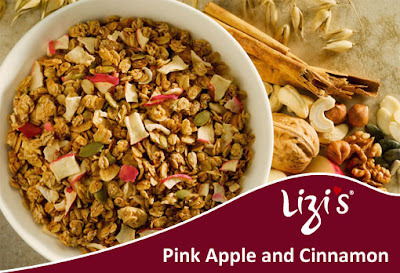 Lastly let's talk about the pink apple and cinnamon granola*, the pack pictured in the header is a single use serving and contains the usual oats and nuts with the addition of concentrated apple juice, air dried apple flakes and cinnamon. The flavour is incredible and I love the combination of the apple and cinammon, which also happens to be one of my favourite candle scents. The picture above is exactly how it looks dry and as with the other varieties you can pair it up with yogurt or milk for a creamy and tasty breakfast that is a change from anything you've tried before. I wouldn't hesitate to recommend Lizi's granola and I think you'll all love it. If you want to check out their range you can do so on http://www.lizis.co.uk/ which has an online shopping option, I've also seen Waitrose stock them so that is also an option. Thanks for reading, I hope you liked this post and you will see more in the series soon!